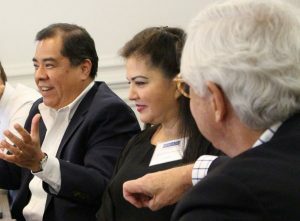 Mergers and Acquisitions: restructuring in today's competitive market - WorldCity, Inc.
Panelists Cesar Salas, left, from Hamburg Sud and Rocio Sarabia, middle, from Lexmark. 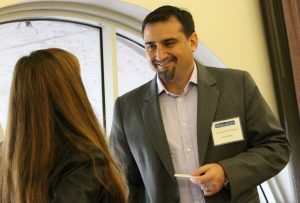 Click here to see our Facebook photo album from the event. It is one of the most difficult scenarios any human resources manager must handle. Mergers and acquisitions have the power to create nervous uncertainty among employees to a level that can suspend productivity company wide. 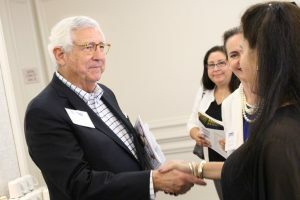 Dual speakers at WorldCity’s HR Connections shared how they’ve handled the various elements that HR must handle when dealing with mergers and acquisitions. 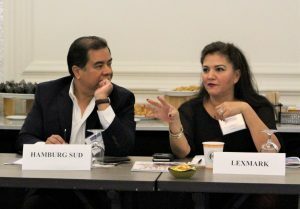 “I always like to focus on, ‘What can I control?’,” said panelist Rocio Sarabia, HR director for Latin America at Lexmark International. The alternative to this will make the situation even more difficult. “Sometimes (employees) are not going to hear our voice, but if we don’t speak up, it’s going to be worse,” said Sarabia. “How do you make sure all of these leaders are able to deliver exactly the same message?” asked Giuliana Castro, HR manager at Grunenthal. “Create a forum where leaders can vent a lot first. Express everything they need to express first as individuals, because then they need to act as leaders,” said Sebastian Bustos Rappa in agreement, head of HR for LATAM at Grunenthal. Bustos Rappa noted the scene from the film Saving Private Ryan where the unit did not want to go chasing after Private Ryan but Tom Hanks’ character, as leader of the unit towed the company line with a consistent message of the importance of the mission. Your company’s best talent often will begin searching for opportunities with more future certainty in the midst of a merger or acquisition; however, there are ways to try and get them to stay aboard through the process to help the company. Beyond the closing, there has to be something else, or these leaders could just cash out the retention bonus and leave after the merger or acquisition is complete. There is also competition for that best talent, with its own ways to incentivize leaving, once word leaks that a merger or acquisition is coming. Mestepey said word of a merger or acquisition tells companies like his a group of high value employees may be available that normally would not have been approachable. HR managers must keep this in mind. If layoffs are coming, don’t execute them from the stereotypical ivory tower of the corporate offices. Show up. Sarabia didn’t go into details of what the package included for departing employees, but being on the ground massively helped the situation. Click here for a calendar of our future events.